Members of the United Steelworkers who work for National Grid have been locked out since the summer. Negotiators for National Grid and the United Steelworkers bargained late into the night on Friday, in an attempt to reach their mutual goal for wrapping up talks and ending a six-month lockout. The two sides had signaled optimism recently that the end of the prolonged standoff might be in sight. But shortly before 1 a.m. Saturday, the company and union issued a joint statement saying they had not yet reached agreement, but will continue negotiations. Details of the offer were not disclosed. After a break for Christmas, bargaining resumed this week, with sessions Wednesday, Thursday, and Friday — the day both sides had set as a goal for reaching a deal. 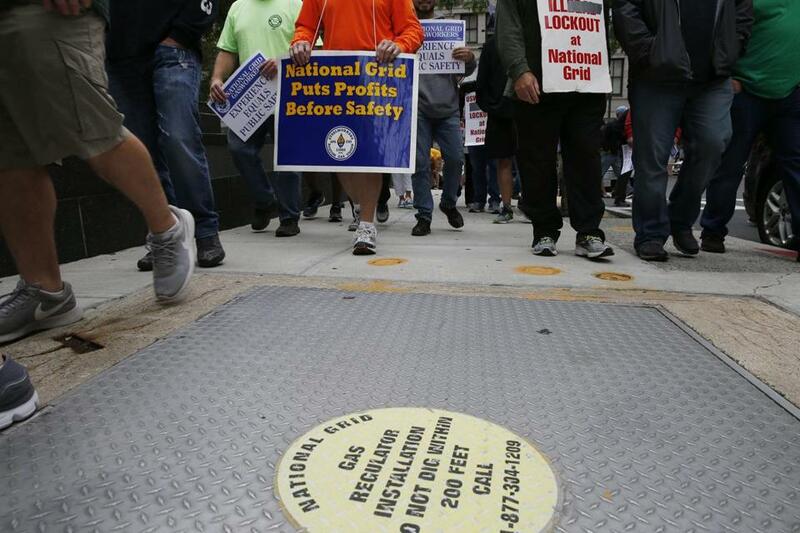 Political pressure has been building on National Grid to end the lockout of about 1,200 natural gas workers. The workers’ unemployment benefits are set to expire as soon as Jan. 14, according to the unions. In December, the Massachusetts House and Senate passed bills that would extend unemployment benefits for up to 26 additional weeks, or until the lockout ended. A separate bill that would require National Grid to provide health insurance to the locked-out workers and deprive the utility of rate increases and public funds was the subject of an emotional public hearing in early December. Joe Kirylo, president of USW Local 12003, issued a statement Friday asking supporters to call Governor Charlie Baker’s office to urge Baker to sign the bill extending benefits for union members. A Baker spokesman said Friday that the administration is still reviewing the legislation. State legislators have also sent letters to the Department of Public Utilities voicing concerns about gas safety and urging fines for safety violations the locked-out workers said they have observed at job sites. A moratorium on nearly all National Grid work was issued by the DPU in October after a spike in natural gas pressure in Woburn, although it was lifted in late December. Developers facing a potential yearlong backlog in getting gas hookups due to the lockout have been growing increasingly concerned about completing their projects and getting them on the market. Of the 116 cities and towns in the state that rely on National Grid for gas service, 85 are affected by the lockout, which began in late June after months of contentious contract negotiations. The main sticking points: the company’s proposal to offer a base health care plan with deductibles and coinsurance and replace pensions with a 401(k)-type plan for new hires, both of which have been agreed to by nearly every other National Grid union. After the contract expired at midnight on June 24, National Grid refused to let employees in, even though the unions had offered to keep working under the old contract. On July 1, the company halted the workers’ health insurance, and entire families lost their coverage, leaving some in precarious positions. The unions have helped many members with health care coverage and other bills during the lockout. In December, Eversource gas workers held a Christmas party for the locked-out workers and their children. Union members have picketed during lockout, monitored the work of replacement workers, and reported infractions to the DPU. Boston Gas, which was acquired by National Grid, locked out its workers for five months in 1993. A number of current National Grid employees have been involved in both work stoppages. Abbi Matheson of the Globe staff contributed to this story. Mark Arsenault can be reached at mark.arsenault@globe.com. Follow him on Twitter @bostonglobemark.